There are numerous restaurants in Branson that offer unique dining experiences for families. We’ve listed just a few so you can put them on your list of places to check out while on vacation in Branson! 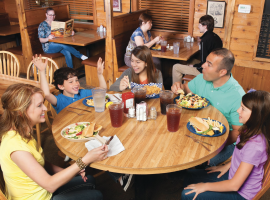 Fall Creek Steak and Catfish House offers a wide variety of family favorites. You’ll find favorites such as fish, steaks, chicken, BBQ, pastas, sandwiches, and more. Before the meal, be sure to try an appetizer such as smokehouse nachos, cajun shrimp skewers, potato skins, or coconut shrimp. This restaurant also offers a nice salad bar that is a perfect accompaniment to any meal. Also, keep your head up for flying rolls and be ready to catch them because they will make your mouth water! McFarlain's Family Restaurant is a great place to find a home-cooked style meal. From breakfast to lunch and dinner, there is something that everyone in your party will love. Their breakfast menu features favorites such as biscuits and gravy, belgian waffles, pancakes, giant cinnamon rolls, omelettes, and more! For lunch or dinner try their famous pot pie, chicken fried steak, deep fried catfish, or chicken alfredo pasta. You won’t want to leave without trying their delicious desserts! Try their ice cream, pies, and cake! Mel’s Hard Luck Diner is a unique diner with a special twist! The servers sing to you! Each of the servers at Mel’s Hard Luck Diner are amazing vocalists and are featured on several songs throughout your meal. On top of the outstanding music, their food is just as great! You’ll find traditional diner-style favorites with fun names such as: Chattahoochee Chicken Fingers, Love Me Tender Fried Steak, Hunky Tonk Hot Dog, and Blue Suede Salad. You’ll also want to pair your meal with a hand dipped milkshake! Don’t miss out on these awesome family restaurants! They will be sure to please your entire party by offering a great meal along with a memorable dining experience!